Sometimes it takes a one-two combo to get a toilet bowl sparkling clean. 6 oz. under and around rim. Want to find other ways to use Clorox® Toilet Bowl Cleaner - with Bleach? Will Clorox® Toilet Bowl Cleaner - with Bleach harm my pets if they drink the toilet bowl water? Incidental bowl water ingestion from a toilet cleaned with the product should not be a problem. However, it is not recommended that toilet water be used as a source of drinking water for pets. If a pet ingests undiluted product or toilet bowl water containing the cleaner, it is recommended to follow up with your veterinarian. Will Clorox® Toilet Bowl Cleaner - with Bleach discolor my colored toilet? The recommended use will not harm colored toilets. By using Clorox® Toilet Bowl Cleaner - with Bleach, you can disinfect and remove tough stains for a cleaner, brighter toilet. Does Clorox® Toilet Bowl Cleaner - with Bleach contain abrasives? No, the product does not contain abrasives. Clorox® Toilet Bowl Cleaner - with Bleach is a non-abrasive formula that will not scratch surfaces. Is Clorox® Toilet Bowl Cleaner - with Bleach safe for septic systems? Yes. When used as directed, Clorox® Toilet Bowl Cleaner - with Bleach is safe to use in septic systems. The bleach breaks down rapidly to mostly salt and water. 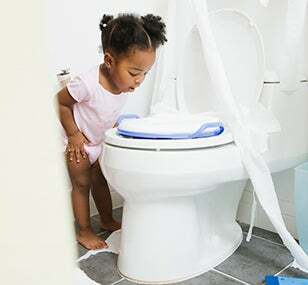 Can I use Clorox® Toilet Bowl Cleaner - with Bleach when I have a Clorox® Automatic Toilet Bowl Cleaner tablet in the toilet tank? Do not use or mix with other household chemicals such as other toilet bowl cleaners, rust removers, acids or products containing ammonia. To do so will release hazardous, irritating gases. How often should I use Clorox® Toilet Bowl Cleaner - with Bleach? To make sure your toilet is sparkling clean and stain-free, use Clorox® Toilet Bowl Cleaner - with Bleach each time you clean your bathroom. Where can I get coupons for Clorox® Toilet Bowl Cleaner - with Bleach? Check the Coupons page to see if there are coupons available for Clorox® Toilet Bowl Cleaner - with Bleach. And sign up for the Clorox® newsletter to find out about new coupons via e-mail. Where can I buy Clorox® Toilet Bowl Cleaner - with Bleach? You can find stores near you that sell Clorox® Toilet Bowl Cleaner - with Bleach on our Where to Buy page. It's a good idea to call the store before going, to make sure they have it in stock. If you have any trouble finding it at a nearby store, you can also buy it online. How do I make sure I've killed bacteria in the toilet bowl? *Always read and follow precautions and usage directions before using cleaning products. Always store cleaning products out of reach of children. Rated 4 out of 5 by Himtotum from Awesome product I bought it a week ago. Happy with results. Smells great.